I’m working on a re-design of this site – I’ve mentioned this. What I haven’t mentioned is why, what’s involved, or how it may affect the people who have been faithfully reading for a while (and, while we’re on that – thank you if you have). Let’s start with some history. In November of last year, I skipped National Novel Writing Month to write 50 thousand words in this blog instead. I dropped a post every weekday for the entire month, and for much of December, January, and part of February following that. In February, however, I took at job with Modern Earth Web Design, here in Winnipeg, as an Online Marketing Specialist. My blogging momentum dropped, but so did a couple of other things, including the regular posting of The Dowager Shadow, which only made it to chapter 4 as a web serial. I had intended to continue posting daily, and working on Dowager Shadow – but job transitions are difficult, especially moving into a new K2-style learning curve as I did. So, both the blog and the novel fell off. I want to fix both of these things. My sensei and I are working on a project outside of this blog, to create an information resource for web workers. This project removes some of the pressure of currency from my blog, and will allow for some new challenges and opportunities down the road. I’m also re-building the Dowager Shadow’s website, and working on finishing the book. More details will come on that front – but it will mean I’ll be a little quiet during November, because I’ll be participating in National Novel Writing Month (with only a limited expectation of completion). Lastly, I’m rebuilding this website with a focus on supporting the work I’m doing at Modern Earth. It won’t be a “hire me” blog – but it will certainly be far more clear that I do, in fact, want to work with businesses on growing their presence on the web. I’ll keep you in the loop as the site is rebuilt. The aim for completion is the end of December – so it’ll be an ongoing process. The short of it is that things are changing – and I’d rather keep you all in the loop over how, when, and what – even if I’m not quite ready to share the why – rather than springing things on you later and causing confusion. Sometimes the plans are as important as the execution. Your Products Are Not Free. Your advice may be, but your products are not. We often give advice to friends. What to say, where to eat – even how to grow their businesses. We don’t consider this advice an invoice-worthy exchange, because our friends are asking for opinions, not consultations. There’s a difference. This line doesn’t just change the value of the work we then do for pay. It changes the meaning of the work we do for free, because there’s a ceiling. Even our gifts become transactions, once we move the line of needs-exchange. We hope that those who, in the past benefited from work we did for free will appreciate that work more, but that’s almost uniformly not the case. More often, these beneficiaries will poo poo us for the new fees on what they once considered privilege. Want an example? Examine the circumstances like those under which JC Hutchins found himself earlier this year are more common than we think. JC, for those unfamiliar, gave away the fruits of his labour for ages – until presented with the line of needs-exchange, by publishing his first novel. JC had a community, and they paid for the book he published and were honoured to support him, but there was a definitive thud when he took all of his “free” things away, to be replaced with products. JC absolutely did the right thing – for himself, and ultimately for his community – because the line allows us to focus, and produce better work. But how do we avoid the possibility of retroactively penalizing of our communities? We need to set the line firmly, clearly, and early. We need to not allow those who want to engage us the privilege of sucking up our early resources – and to limit the liabilities which will restrict our ability to provide benefit for them in the future. By carving out the line early – whether there’s anything behind it or not – we limit our liabilities, and create clear expectations of where we are available, for what kind of work. My blog is free. So are the comments – any advise or insight I can provide there is public, benefits more than just one person, and thus is open. My twitter feed is free, as are replies in it. Public, not focused (even when directed) thus free. Email is not free, because it’s directed and focused and limited in visibility. Email, for me, is consultation. The same goes for instant messenger, unless you’re a special case like family, or legitimately a friend. And most of Facebook, because I moderate my friends list there. Lunch, or scheduled meetings, are both considered product – they cost money. My writing is a product. 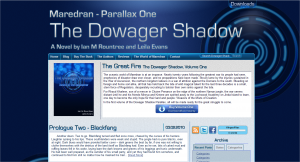 Once the Dowager Shadow is finished – even just the first volume. I’ll be selling from day one, and the free preview on that site will be coming down. Anything I tell you is a product, is a product. Whether it’s speaking, facilitating discussions, consultation, ebooks, or physical stuff – if it’s a product, I expect it to involve a transaction. If I don’t tell you we need to have a transaction for something – guess what? – no transaction. Not difficult. I hope. You think? Sensing a trend? What’s public and open is easy to call free. Expect limited time spent, controlled reaction, and considered value on my part. The onus is mine – and yours, if you work in the open – to create not only clear demarcation of free advise versus paid product… But also to create clear differences in value between the open and the closed. These kinds of clear, precise markers will save us all a lot of hassle, if we only learn to use them well enough. In the very near future, this site will be changing. I’m about three-quarters of the way through developing a new wordpress theme for my site – it’s been a long process mostly because I haven’t been able to nail down what I need out of a theme’s functions. I’ve been wanting to do more than just blog for a while now, and with the impending release of WordPress 3.0, there are some features I’ll take advantage of to add a lot of functionality to my site. I’m going to be posting some fiction. I’ve been writing fiction in a rather fragmented manner for over fifteen years. In February, I started sharing one of the more fully formed stories at Dowager Shadow – which I’ll get back to in a big way in the coming weeks. However, there are a few hundred pages (actually, my last count was roughly 1500 pages) of short story, plot fragment and world building I’m going to begin sharing here, in a new Fiction section – everything from fantasy to science fiction, and a few other interesting tidbits. I’m also going to start posting non-fiction, non-blog material. I’m not one of those ebook guys, but I have written a number of long-form essays and what may be called white papers in the last few years. None of this has made it to my blog because I couldn’t translate it into a blog-able format. This changes with the new function developments for my new site – I’ll be contributing more than just my thoughts. Regular readers know I’m a bit of a research geek – now I get to express that in a very digestable way. The blog will become a little more interesting, too. As I’ve been getting down into doing the work of online marketing with Modern Earth for the last few months, I’ve learned a lot about myself, people in general, and the struggles people can face when first entering a new business (like I have, going from retail to marketing). I’ll try to keep it interesting, but sadly I can’t guarantee a schedule. What I can say is that I have a number of series planned – continuing the Apostolic Shift exploration, and some comparative theory for social economics. I’ll also be dissecting a lot of common practice in a comparative manner as I did with my last post about Fight Club and Presence Media. I’ll also be continuing to contribute elsewhere. I’ve been trying to make more time to write for Mark Dykeman‘s Thoughtwrestling blog – the ka-tet is phenomenal, everyone’s so involved, and I want to make sure I can help as well. This is part of why my own posting schedule will be remaining at not-once-per-day. I’m also starting a new collaborative blog with someone else – more detail to come as that matures. In addition to blogging, I’m going to be using other media more often. I discovered Mack Collier’s #blogchat a few weeks ago, and I’m hooked. So I’m on that as often as possible – and I’ll try to begin posting recaps here, what I take away from each event. I’m also going to be podcasting as part of the secret project, and trying to support some other podcasts as well. So trust me – I’m not going anywhere. But what you’ve come to expect from this blog and my involvement in every community I’m in so far will begin to mature very swiftly as I get a better idea of what is a sustainable method for me to be involved. Stay tuned! I really dropped the ball on The Dowager Shadow this week, and it’s killing me. I went nearly a week without a post, and then three in a row, missed a day… And so on. Now, we’ve hit the end of Chapter Two, and Chapter 3 begins on Friday. Posts are scheduled right up until the end of the month, but it hurts anyway because it’s a funny way to behave for a project that’s finished for all intents and purposes, but for breaking it up and posting it all. The same reason any beginning project has hiccups – I didn’t set myself appropriate deadlines, and let other things get in the way of the project. You must have had this happen, am I right? That’s the trouble with fluid deadlines. If you don’t have a schedule – an editorial calendar, or a goal for full publication – you’re bound to let something slip eventually. Luckily for me, that was this week, when Dowager Shadow has all of twenty subscribers and no one is commenting, rather than two months from now when it’s finally got traction. But isn’t it amazing that this happens at all? I mean, productivity happens when you want it to, doesn’t it? And I wanted the novel do go off without a single hiccup, which was why I spent six months planning the launch before I launched. Silly, right? But what I failed to do – what so many of us fail to do in our planning – was set hard and fast goals. And how can you win if you’re not keeping score? If you’re unfamiliar with The Dowager Shadow, or need to get caught up, check out the Table of Contents page and start from Prologue One, “Shadow Hunter” – it all follows from there.